Editor's Note: This article appeared in the 1990 Lake Sun Leader Newspaper. Additionally Hohn Scout Reservation became Lake of the Ozarks Scout Reservation effective September 23, 2011. Laurie – In December of 1960, a sergeant with the Missouri Highway Patrol, D.J. Slevin, was called to investigate a burglary at the home of Dr. Roland Hohn, off RA Road in Laurie. But Sgt. Selvin happened at the time to be active with the Boy Scouts of America. He and the Lake of the Ozarks Council, BSA, had been looking for an area close to Versailles and the Laurie area on which to develop a youth activity area. 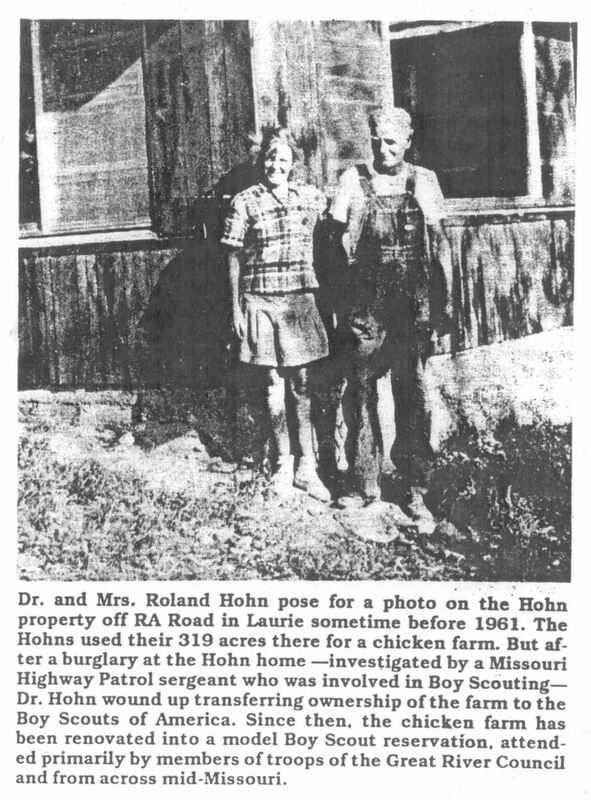 Dr. Hohn, who used his property (originally 319 acres) as a chicken farm, talked with Selvin, and the Boy Scouts Executive at that time, L.E. ‘Red’ Moody about the possible transfer to the Scouts; and in March of 1963, the beginning of the “dream” Hohn Scout Reservation was a reality. When several council members, scouts’ fathers, and friends of BSA toured the property, they thought it too rough for the boys (ages 11-14), with its rocky terrain and sheer drop to the lake. But when scout advisors Charles Bailey and attorney John Inglish led some young Scouts to the site, they considered it ideal, and a challenge to the “city boys” who were unfamiliar with such activities as rappelling and pitching and striking tents. Current Scout Executives Wiley Tracy (BSA Field Director), K.K. Johnson (Board Member), and Bill Davidson (Executive Committee member) recall how the Hohn property fit the three criteria established by the Lake of the Ozarks Council: a minimum of 300 acres, on our near the Lake of the Ozarks, and within the expenditure guidelines that would include land, a lodge (Hohn’s house is now the residence of Camp Ranger Danny Claiborne), health lodge, commissary building, and five staff cabins, as outlined in December 1955 by chairman Edgar T. Ward. Rex Whitton, council chairman at the time of the Hohn transfer, helped develop some parameters, such as projected attendance based on other Scouts camps such as Camp Pa He Tsi in Kaiser, season usage (7 weeks), and initial staffing needs. In June of 1965, the first Boy Scouts descended on Hohn Scout Reservation, in a series of “overnights” and weekends to familiarize the boys with building campfires using flint, (rather than kitchen matches), striking tents, exploring the eight miles of perimeter, hiking the trails, and attending Sunday worship services in the open air Parkhurst Chapel. And Finance Committee members William Parkhurst, E.W. Fischer (an inventor of the coin slot pool table, who donated all materials and layout for the administration building and commissary, Fisher Lodge), and Mike O’Connor. The committees were given a June 1, 1966 deadline for placement of permanent latrines, rifle range, swimming dock, tents (24), refrigeration (William Tweddie eventually provided a 20 foot upright), patrol stoves, and a flag pole (compliments of Richard Parkhurst and the Belchers). All were accomplished, and the summer of 1966 saw six weeks of activities, with Scouts from various troops and councils visiting Hohn Scout Reservation. Help from local business people, including Roy Anderson (a contractor), and the Moore family (Les, Tom and Tom’s brother) was ongoing in the fledging years of the camp. In the early 70’s some of the camp facilities began to show signs of aging, and another group of planners got together in Tipton to determine a strategy for maintaining the popular Boy Scout facility. Included at the meeting were Ben Hainen and J.W. Proctor of Tipton. D. Selvin of Versailles, and F. Jinkinson and E. Rudder of Lake Ozark. A steel, 6,000 gallon water storage tank was proposed, as well as the camp administration building, and J.W. Proctor was commissioned to develop the construction, including modifications such as the addition of a ladies restroom with private outside entrance, and relocation of the fireplace. Bill Chapman of Versailles did not of the ‘dozer work’ and Buz Kuhl of Gravois Mills provided a back hoe that helped development of a playing field on the south side of the camp’s entrance road. A C.O.P.E program at Hohn Scout Reservation took form (C.O.P.E. stands for Challenging Outdoor Physical Encounter), and was soon understood to not only provide a challenging physical fitness and endurance for the Scouts 14 and older, but also to attract national attention from corporations who considered it to be of use in leadership development and confidence building. With the completion of the C.O.P.E. course Hohn Camp also increased the penetration of the area surrounding the Lake of the Ozarks.